Boeing is battling both image and commercial crisis following its reluctance to officially ground about 350 of its latest jet, the B737 MAX 8 in operation across the world. Two of its jetliners crashed in Indonesia and Ethiopia within five months in similar circumstances, claiming 346 lives in the process. Virtually all airlines and regulatory authorities across the world have grounded the Max 8, but Boeing is apparently the only company refusing to follow suit in what aviation experts say was a suicidal position as the aircraft maker is now seen as clinging tenaciously to profit while events spiral out of control. While the investigative report of the ET 302 crash is awaited, European low-fare carrier Norwegian Air is seeking compensation from Boeing for its grounded fleet of 737 MAX 8 jets. The carrier has become the first airline to say publicly it would demand that Boeing pays for lost flight time. It is expected other airlines will follow suit in a matter of days. The United States, Canada the United Kingdom and about other 50 other aviation authorities throughout the world have ordered the grounding of the jets on Tuesday in the wake of the crash of a 737 MAX 8 aircraft operated by Ethiopian Airlines that killed all 157 people on board. Norwegian has 18 737 Max 8 planes in its fleet, mostly for trans-Atlantic flights between Europe and the East Coast of the United States. 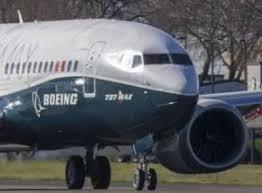 The airline has ordered more than 100 of the 737 MAX 8 planes. Kjos apologised to customers affected by the grounding of the planes and said passengers would be taken care of by combining flights, reallocating aircraft and rebooking customers on other airlines. He said Norwegian lost just 1% of the airline’s seat capacity because of the grounding, and he hoped the planes would be back in the air soon. A growing number of airlines have also announced they won’t fly the planes until they know what happened in Sunday’s fatal crash. Spokespeople for Norwegian Air would not discuss how much money it would be seeking from Boeing for this grounding. Accurate estimates as to what Boeing would have to pay are difficult to come by. It is determined by terms of closely guarded sales contracts between the aircraft maker and its customers. Just being late with a delivery can cause Boeing or rival Airbus to compensate its customers. During the 787 problems in 2013, All Nippon Airways reported that it lost revenue of nearly $1 million for each of its 17 grounded planes in just the two weeks of the shutdown. It said it would seek compensation from Boeing to cover that loss. Analysts say Boeing is reluctant to ground the Max 8 jets because it fears it’ll arch-rival, the Airbus may gorge into its market share.